KNOX provides green jobs training and career counseling to out-of-work residents in Hartford. Members take part in horticultural training and life skills workshops before advancing to further educational and employment opportunities. In exchange for their service, members earn a living stipend and receive school and job placement counseling for one year after completing their service. 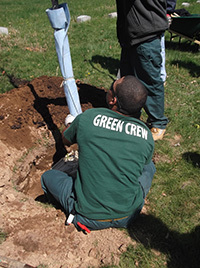 Tier 1 – Partnership with the Hartford Youth Service Corps where young adults work three days a week alongside KNOX’s senior staff to learn landscaping. Tier 2 – Immersive, in-house job training program for young adults to learn horticulture and life skills. Tier 3 – Partnership with the City of Hartford’s two golf courses, Goodwin Park Golf Course and Keney Park Golf Course, where we place now fully-trained members into jobs. Want to serve Hartford at KNOX? Learn landscaping, environmental, leadership and life skills while making Hartford a better place to live and work. Members receive a living allowance every two weeks. Download application here. Please return completed applications to KNOX. We would like to thank the Timberland Company for their generous donation of boots for our Green Crew. Timberland has offered to outfit our corps members with brand new boots every year since 2007.